In the face of the ongoing global financial crisis, it has proved difficult for the Organization of the Petroleum Exporting Countries (OPEC) to sustain oil prices by cutting the output, observers say. On Oct. 24, OPEC announced the cut of daily oil output by 1.5 million barrels. But instead of boosting the oil price in the international market, the move prompted world oil prices to plunge to a 17-month low. Brent North Sea crude for December delivery was slashed to 61.08 U. S. dollars per barrel, which was last seen in March 2007. New York's main contract, light sweet crude for December delivery slumped to 63.05 dollars a barrel, the lowest since May 2007. On July 11, 2008, the oil price hit a record high of 147.27 dollars per barrel, but it has plunged sharply thereafter. Over the past three months, oil price has seen a steep slide in the international market, partly triggered by the financial crisis across the world. Against this background, OPEC, which produces around 40 percent of the world's oil, rescheduled its extraordinary meeting by putting ahead the November meeting to Oct. 24, aiming to debate about the output cut. In a resolution issued at Oct. 24's meeting, OPEC vowed to monitor the international market to decide whether to take further actions. "There is over supply in the international market," OPEC conference president Chekib Khelil, who is also Algeria's energy minister, told a press conference after the meeting. 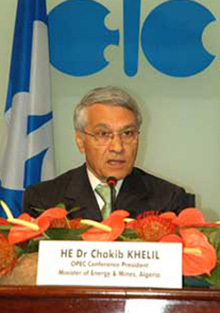 Khelil said an OPEC meeting scheduled for December will review the oil supply and decide whether to further cut output. Observers believed that OPEC may launch another cycle of output cut to salvage the oil price. "We believe this week will mark the start of a new quota reduction cycle by OPEC and it will continue through 2009," Deutsche Bank analyst Michael Lewis said. In retrospect, over the past 10 years, OPEC had made three major output cuts, in 1998, 2001 and 2006 respectively, but each saw no immediate price rebound. Just as Khelil pointed out, apart from supply and demand, speculation in energy market is an important factor affecting the oil price. The International Energy Agency (IEA) was critical of OPEC's cut. "It is not a helpful decision because markets are quite nervous," Eduardo Lopez, a senior analyst at the IEA's oil market division, was quoted as saying by local media. On the issue of output cut, OPEC is facing a bewildering situation both within and outside. For one thing, the world is calling for a reasonable oil price to fight a possible global economic recession stemming from the world financial crisis. As a matter of fact, investors across financial markets are increasingly pessimistic about the world economy. European and Asian stocks fell sharply on Friday, led by a 10 percent drop in Japan's Nikkei average and 5 percent in the German DAX index. Germany, the biggest economy of Europe, has slashed its economic growth from 1.4 percent to merely 0.2 percent for 2009. Earlier this month, Germany's major economic research institutes warned that Germany was "on the edge of a recession" due to the global financial crisis. Last month, oil demand in the United States, the world's biggest oil consumer, fell to the lowest level in more than five years, at 18.6 million barrels a day, according to the Department of Energy. Prior to OPEC's decision to cut the output, British Prime Minister Gordon Brown described the cut as "wrong for the world economy," saying it was "absolutely scandalous" amid a global economic crisis. OPEC members were divided over the output cut as each member has its own target price. Saudi Arabia, the biggest oil exporter in the world, is the lowest-cost producer within OPEC. World media widely estimated that Saudi Arabia can afford to let oil prices fall for a while without hurting its budget as it could sustain oil prices between 55 and 65 dollars a barrel. Other OPEC members are not so fortunate, as they need higher oil prices to support their budget requirements. Nigeria's Oil Minister Odein Ajumogobia said his country would be more comfortable with 80 dollars a barrel. Qatar has set a range of 70 to 90 dollars a barrel as the target price, while Iran said any price below 90 dollars a barrel would hurt some oil producers.